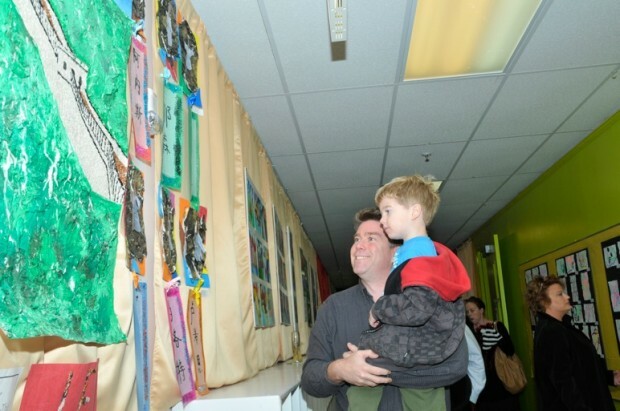 Why is Arts Night a Success? Arts Night is a massive undertaking. Our Art teachers, Haiying Yang, and Aïcha Idelcadi, along with their students, our Early Years Program teachers, and an army of dedicated volunteer parents... put so much time and effort into this one magical night. When I say that they worked tirelessly, I mean it. Weekends, after school, during breaks, at home, at school... they literally poured their hearts into this one event. The week before Arts Night, when everyone was exhausted and people were steaming curtains, hanging fishing wire, creating backdrops, printing out names, creating lists upon lists of inventory, food, etc... you have to wonder if it's worth it! Then, Saturday comes, and the doors of Cohn Campus open. Families pile inside, and you can hear the laughter, joy, and wonder coming from our parents and students alike. I have to say that while I love all of our events at school, Arts Night holds a special place in my heart. It's the one event where our entire school gets together and allows our students to share their imaginations and treat them like the special artists they are. "Mommy, I helped with two of those boats! I made arrows!" 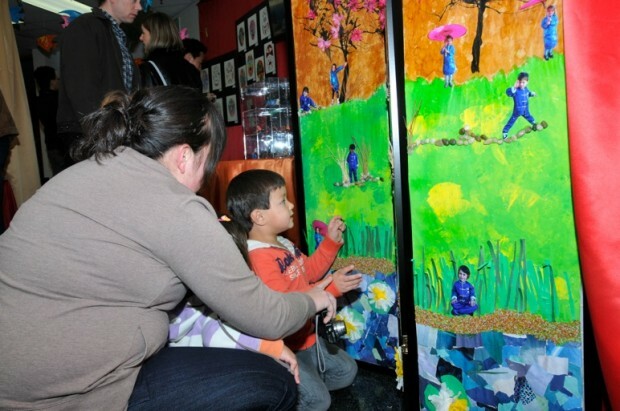 I heard a Chinese Kindergarten student exclaim while pointing to the incredible exhibition from David and Chuhsi's class. She ran into the school and leapt into David's arms. The huge smile on her face showed how incredibly proud she was to have her teacher there and for her to explain to her parents what her art was about! I love that the younger classes surprise all of the adults, who often cannot believe that the work is done by such young artists. I said it often during the evening, that our younger students are at a wonderful age where they're not yet influenced by outside sources and are able to express themselves with no inhibition. Overall, the evening was a success, with many people, including our school's founder, Charlotte de Géry, commenting that this was one of the best Arts Night they've seen to date. This is a huge compliment! During the evening, parents said things like, "it's the first event during the school year where we can touch base with other families and see how their first trimester has been going," or, "it's always a great event! We never miss it!" Parents told me how proud their children were, how talented the teachers are, and one parent confessed that her daughter decided to miss her soccer tournament just so she could go to Arts Night! 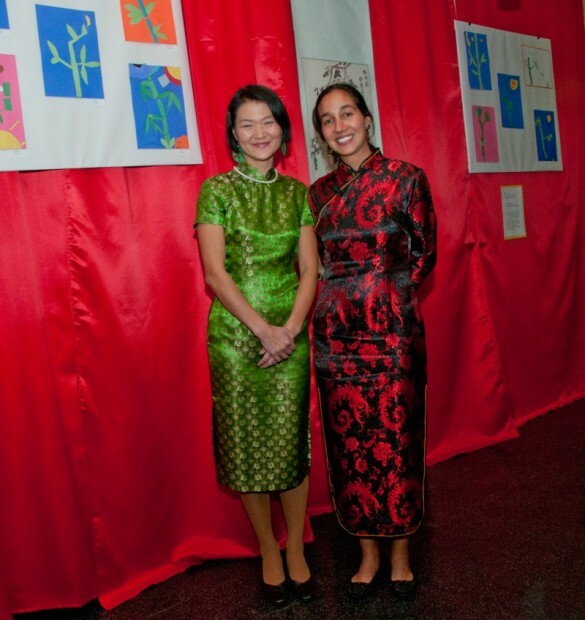 Kathy Tsai and Eileen Horng, co-Chairs of Arts Night. These two superwomen impressed me with how they organized and worked on this event. They handled any challenges and surprises with calm and grace. Thank you, ladies. Marie Christine Champain and Carolyn Lott for all of their help. Milli Sarrazin, Arts Night Food Chair. This woman worked nonstop, on her feet from 10am to 10pm, directing volunteers, organizing everything and making the Rothschild Multipurpose Room the envy of any holiday party or event. Thank you to Milli and her team of volunteers (like Debbie Cole, Julia Wei, Penelope Joye, Margaret Reid -- thank you!) for making this happen -- everything was delicious and I am pretty sure a few of them may now have blisters from cutting and spreading over 150 baguettes! Of course, when speaking of food, we cannot forget to thank Véronique Micha for her sweet and delectable verrines, and the delicious red bean soup by Lillian Kurtz. Other community members, like Francesca Clubs, her sister Vivian Luu, and their mother, who made over 1,000 pieces of five-spice drumsticks! All of the handmade food was a wonder, and allowed our community to discover new recipes and tastes. Thank you! Thank you to Angelique Cucaro, who made the pagoda, and to our Chinese New Year Parade Float team for bringing the dragon to life! 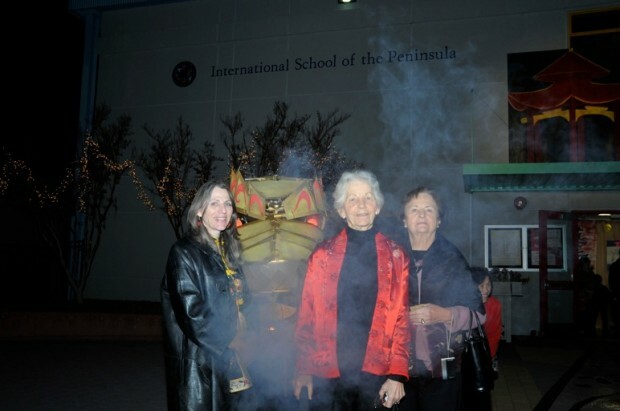 I can't tell you how many children you delighted with the dragon that lit up and blew "smoke" out of its mouth. Everyone felt such awe and pride at the piece, which took 7 cars to transport (in pieces) in the morning, all day to mount it, a dedicated light engineer (Gary Meeker) to write software for the lighting, our own Cardboard and Wire Magician, Warren King, to build it, and then disassemble and take it all back to Los Altos! Whew, I'm tired just thinking about it! 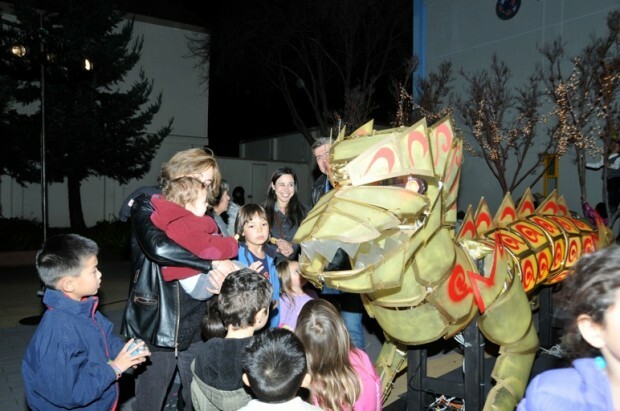 To see the dragon again, I hope you'll join us at the San Francisco Chinese New Year Parade on Saturday, February 11, 2012. Our daycare staff, who made our babysitting run so smoothly. Kids were comfortable and enjoying their time upstairs so our parents could have a few moments to mingle and enjoy the evening. All of our teachers! Thank you for inspiring our students! Last, but not least... let's face it, the WORST part about any event is clean-up. Can you imagine, after hours of a large-scale event, to stay the entire night until the end, or to come back to school just to clean up after everything? These are our Arts Night Angels! Please join me in giving a round of applause to the team of parents who stayed or came back to help clean up. There were too many of you to name, but I want you to know that ISTP is so lucky to have you as parents at school -- you all played a role in the success of the night. Finally... thank YOU, our community, for joining us at Yi Shu Zhi Ye. All of your help made the evening possible, and you are the reason why Arts Night is a success!